Wrap It Up! is a specialty store that primarily provides gift wrapping services. It also offers a wide variety of gift wrapping materials like local and imported papers, gift bags, plastic and cardboard boxes, even baskets. To add that special touch, gift accents are also available – from ribbons, unique gift toppers like mini teddy bears, faux flowers to balloon arrangements. * Wrap It Up! opened its first store in November of 2000 at WalterMart-Calamba in Laguna. * The positive response to the first store and increasing demand for gift wrapping services paved the way for two more Wrap It Up! outlets. * One in WalterMart-Sta. Rosa, and another at Pavillion Mall in Binan, Laguna. 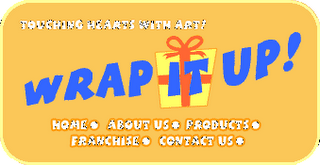 * Seeing the potential of the growing chain of Wrap It Up! stores, franchise inquiries from enterprising individuals were received. * The first Wrap It Up! franchise is now open at WalterMart-Dasmarinas in Cavite. * All Wrap It Up! stores have a standard layout to ensure maximum exposure of items, systematic inventory control and ample space for fast and efficient service. * Wrap It Up! has expanded its products and services associated with gift-giving occasions -- like balloon décor for parties and various celebrations, party planning and events management. DESCRIPTION: Retail sales of gift wrappers, ribbons, balloons and accessories; Gift Wrapping Services and Balloon Accents. I am very much interested in gift wrapping however i can not afford the total franchise fee. Do you sell wrappers and other materials for gift wrapping in a wholesale basis? Yes, me too. I am looking for a supplier of wrappers and other wrapping materials. Let me know please. thanks! I'm interested in the concept of offering gift wrapping services and others but I'm short of capital. Is there any way to go in to this business or create some sort of partnership/mutual connection with your business without shelling out as much capital? Let me know please. I'm from Binan, Laguna. I love gift wrappings,and come up with creating this kind of business. But i dont have much capital to start a franchice, will you cater to sell gift wrapping materials only? thank!